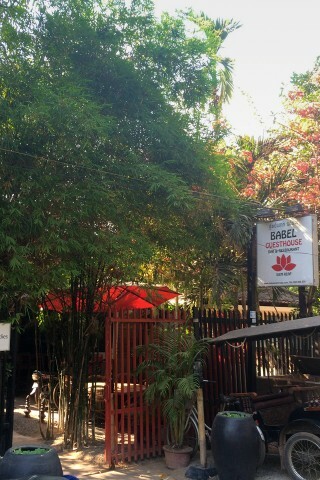 Babel opened in 2008 and has gone on to develop a good reputation for its rigorously clean rooms and great service. Average rating 8.3 from 149 reviews. Set at the end of a quiet dirt road in the Wat Bo area near several other budget to midrange guesthouses, its 24 rooms are spotless and large, if a bit plain. Each has new furniture, hot water and cable TV. Everything is bright white, including the tiles of the sparkling bathrooms, most of which come with full-size bathtubs. The building itself is nothing special, a typical new Khmer structure with a rather surprising mirrored facade, but it’s softened by the lush, private garden, with an outdoor bamboo and grass bar/restaurant and some cool little hang-outs the owners have built in the garden, including hammocks and daybeds. The restaurant serves a couple of the usual local dishes, but the emphasis is on some very reasonably priced Italian food and Spanish tapas. The bruschetta is delicious, though the mains might leave those with big appetites still feeling a little peckish. The bar is very well stocked, all the better to work the ambitious cocktail list which is 100 items long: something to do when the rains set in. While they don’t have a spa - and who does in this price range? - they can arrange massages from visiting therapists. The Norwegian owner/manager works hard to keep this a fun place and genuinely social hang-out, without the sheer mindless bohemianism that you’ll find in more “party” hostels. They also are actively involved in driving responsible tourism and run a programme supporting education in Siem Reap. Guests wanting a splash can use a swimming pool nearby for a small fee. A sign of their success and popularity may be that while everyone else in Siem Reap is furiously cutting prices, Babel have been able to maintain theirs. Room rates include breakfast. Check rates at Babel Siem Reap Guesthouse on Booking.com.